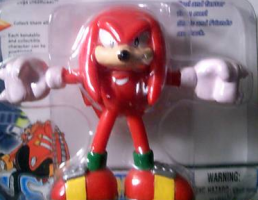 You may remember in February when we reported on a misprinted Sonic Adventure Knuckles toy–you get Knux, but the box has Eggman art. The seller touted it as the “World’s Rarest Sonic Gem,” and with such a classy title came a classy price–$10,000 to buy it, no bidding. Unsurprisingly, the toy didn’t sell. Now, it’s back on the EBay auction block at a recession-level discount–though with the same “extremely rare” and “one-of-a-million collectable” hyperbole. It can now be yours for the low, low price of $1,000. Still a budget buster? Consider that’s a 90 percent discount from the item’s original price in February. The same rules apply as before–no bidding, just “Buy it Now” or make an offer for the toy. Be warned, though–two offers have already been made, and both were rejected. When we asked if you’d pay ten grand for the toy, the response was an overwhelming no. Now, we want to know if your opinion’s change with the new price point. Tell us in the comments below.